History: adult male with ankle pain. 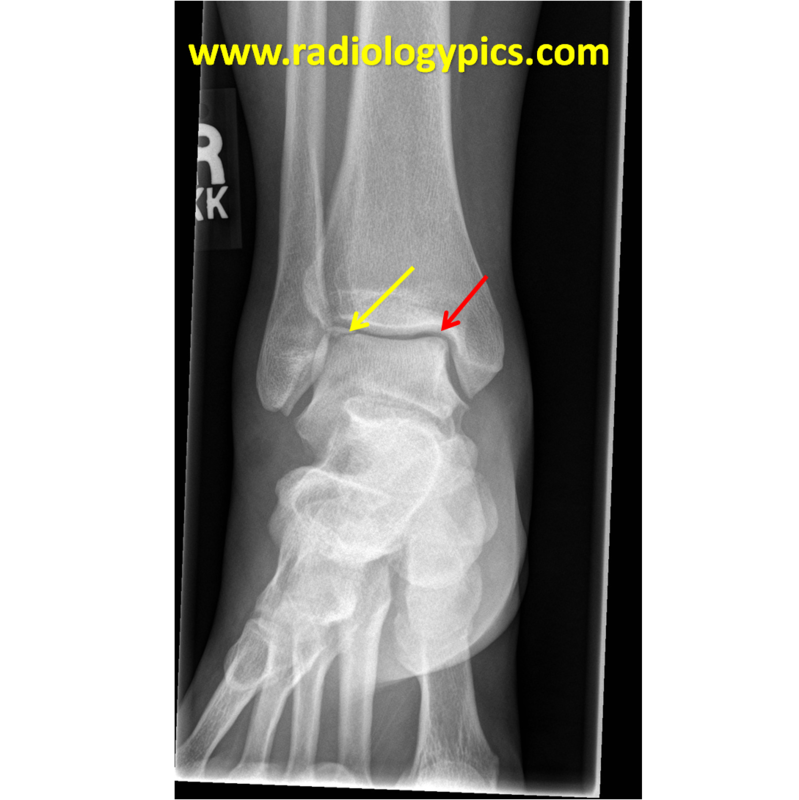 Osteochondral Injury – frontal radiograph of the right ankle reveals a fracture line through the lateral corner of the talar dome (yellow arrow) and a more subtle irregularity of the medial talar dome (red arrow). 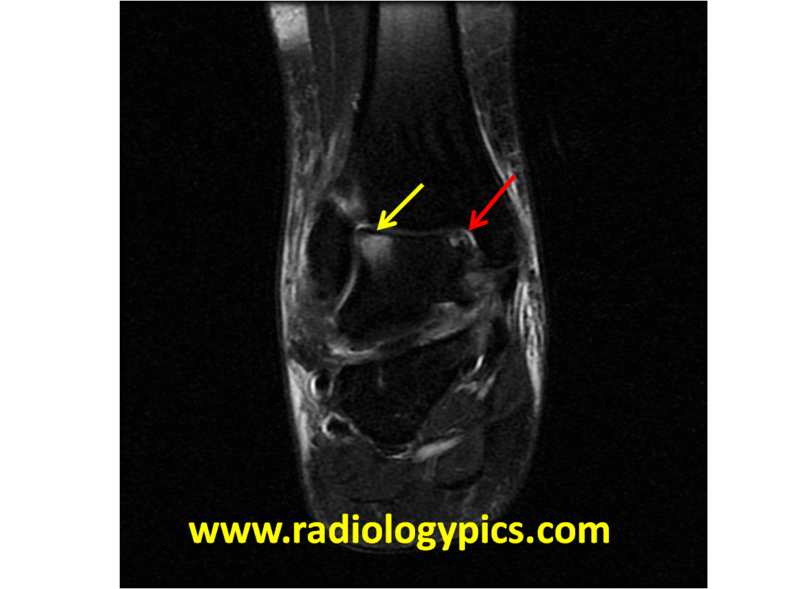 Osteochondral Injury – Coronal T2 weight MRI with fat saturation confirms a large osteochondral injury at the lateral talar dome (yellow arrow) with marked surrounding bone edema characterized by high T2 signal. The overlying cartilage appears intact. At the medial talar dome there is relatively more irregularity (red arrow) with apparent subchondral cyst formation, indicating high grade osteochondral injury. This is the appearance of osteochondral injuries on plain radiography and MRI. The term osteochondral lesion has been broadly applied to include abnormalities of the bone and cartilage that are not acute. In the ankle, osteochondral injuries are most common at the middle third of the lateral talar dome or posteromedial talar dome, as seen in the image above. On MRI, osteochondral lesions are classified occording to the system put forth by Hepple, et al (1999). Using the above system, the classification in the patient above is likely stage 2a at the lateral talar dome and stage 5 at the medial talar dome. MR arthrography may assist in evaluating difficult to image cartilage abnormalities of the talar dome and tibial plafond. Osteochondral injuries may resolve on their own, or may go on to develop loose intraarticular bodies. They can be treated with drilling chondroplasty and debridement or placement of osteochondral allografts. No problem. Thank you for visiting.